So I'm not the biggest fan of Jack-O-Lanterns. And to be honest Halloween is by far my least favorite holiday. But I do love Fall! I love the nice, fresh, crisp weather! I love caramel apple cider! 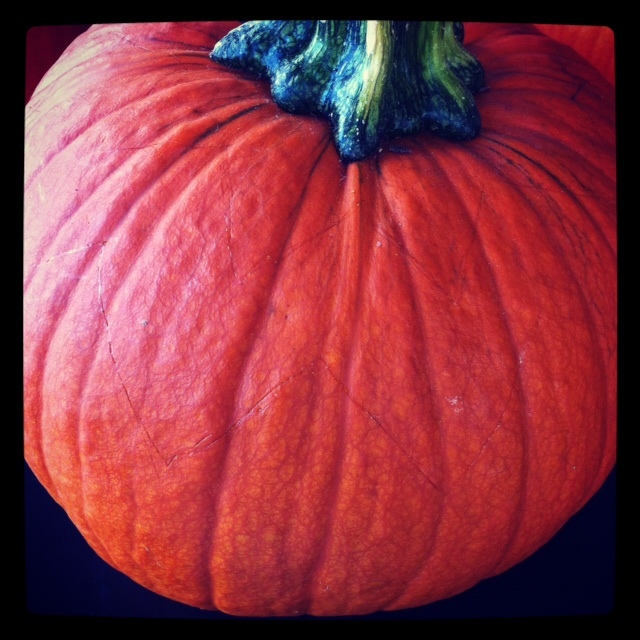 I love pumpkin: pumpkin muffins, pumpkin spice creamer, pumpkin cake, YUM! Needless to say, I don't like decorating for Halloween. The stuff is just too scary. And just not what I want surrounding my kids! BUT, decorating for fall...that's another story! It can be so beautiful! And simple! I came across this pin the other day and knew I wanted to try to make my own!! We went to the "pumpkin farm" as my kids like to call it, last week and we got to bring home four pretty little pumpkins! They were just BEGGING to be painted!! See? It was actually fairly simple! They didn't turn out perfect but I am definitely okay with that! 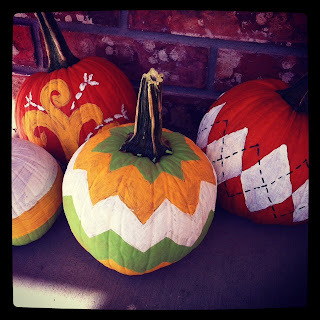 Aren't these so much cuter than Jack-O-Lanterns?! 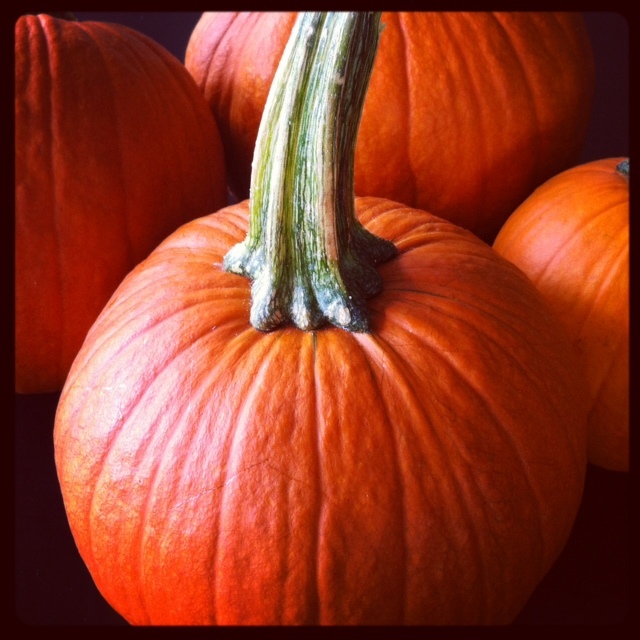 Step 1: Gather your pumpkins! See, I TOLD you this was easy! Step 2: Gather your supplies! If you'll notice, I have a white, yellow and weird orange color. Let's just say the weird orange color was NOT what I was looking for, so I improvised (don't be afraid to improvise!) and used a light green instead! I also have a sponge brush in the picture, but I only used the regular paint brush, it just felt easier to me! Use whichever you like! Step 3: Grab a pencil and sketch the design you want! 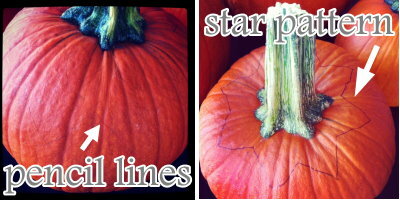 Can you see the really light lines on the pumpkin (left picture)? 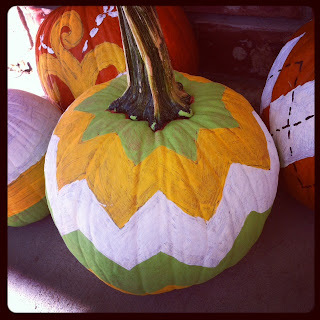 I was doing the chevron stripe pumpkin here! I started at the top and just did a star pattern around (right picture), then continued down making more lines. It does NOT have to be perfect! And if you mess up, you're using a pencil, so you can just fix it! Step 4: Now outline with pen! I suppose this step is not necessary, but it's definitely helpful! The pencil was so light, that I figured it would be kind of hard to paint over it. Hence, the pen. I just used a regular ball point pen. 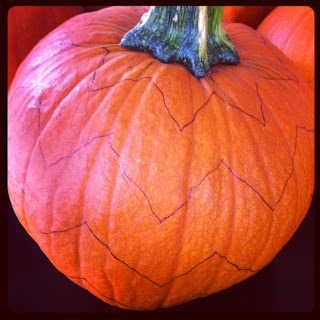 It was kinda fun drawing on the pumpkins with the pen. It's all smooth, and just, different! Don't panic, you CAN do this!! Pour your acrylic paints onto a plate. I poured mine onto three little paper plates. Paint one color at a time. 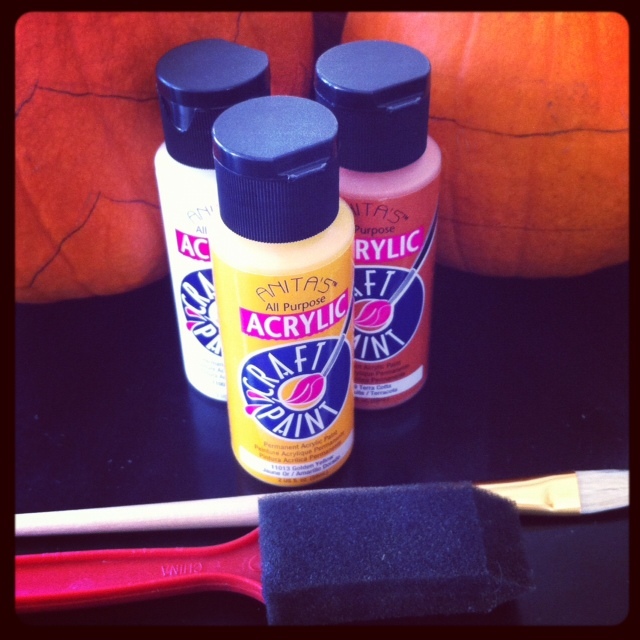 So do all your white paint first, on all your pumpkins. Then go back and do the next color. This allows some time for the paint to dry before you add the next color. And if you decide one of the colors is, um, UGLY as all get out, go ahead and change colors like I did. No biggie! Step 6: Add finishing touches! My favorite pumpkin is the argyle one. I just love it!! And it actually turned out way easier than I was thinking it would! First you'll want to paint on your diamonds. I cut out a paper diamond, then I put the paper diamond on the pumpkin and put little dots all the way around, to make sure I had the right size diamond! 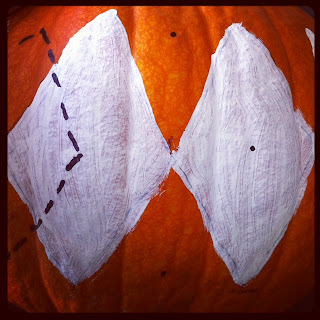 Then I traced the diamonds onto the pumpkin! After you paint them, you need to let the paint dry! Now you're going to add your finishing touch! I suppose you could use black paint for this, but that seemed really hard and messy to me! So instead I grabbed a trusty Sharpie and used that for the little black lines! To help make sure my lines were straight, I put little dots in the shape of a diamond so I would know where my lines should go (see picture below). Step 7: Put pumpkins on your porch or mantle and just LOVE their pretty-ness!